Hosted virus counter: Gain 1credit. Economy booster for 1 and 1. Great combo in Noise: Hacker Extraordinaire. It is a Virus, so it can get 1 bonus from Grimoire, 1 discount from Cyberfeeder, and can be sold to Aesop's Pawnshop. You can also install it onto a Scheherazade to improve the returns, but isn't necessary for a sustained economy. Déjà Vu lets you recur these numerous times. Can effectively store 3 for later use (cannot be lost from Reversed Accounts or Closed Accounts. Wasn't printed as Anarch card to help them save on influence. Great little card though at time of writing only really fits in 2 arguably 3 runners deck. First and most popularly Noise: Hacker Extraordinaire. Install, Mill Take all the counters off maybe pawn it later. Secondly Nasir Meidan: Cyber Explorer unlike Noise Nasir will leave the counters on a Cache allowing him to gain the money as he needs it during a run great for after an Ice res like Pop-up Window. Arguably Exile: Streethawk I've seen it in some exile decks as a draw and burst econ for a Clone Chip i personally don't think it's a good use but it see's play. *I also feel this card could see more play when Salvager comes out. Credits are not in your credit pool until you take the counters off. Aesop's Pawnshop: For a , card and this combo brings in a massive total of 6 spread over two turns. Grimoire: With Grimoire the runner will gain an additional . Aesop's Pawnshop + Grimoire: This three card combo will net the runner a total of 6 for just one ! Put that in a Noise deck and you've just put yourself in a position to cause some serious Anarch chaos. Clone Chip: If the runner doesn't need Clone Chip to grab another program Clone Chip can become a great economy card used to recur Cache. When combined with Grimoire and Aesop's Pawnshop a single Clone Chip can net the runner an additional 5 by the beginning of the next turn. Cyberfeeder or Sahasrara: Use Cyberfeeder or Sahasrara to remove the install cost of Cache. Either of these cards pays for itself in just two applications of Cache. You can also use Sahasrara to install Clone Chip to recur Cache for additional . Scheherazade: You can install Cache on Scheherazade with no fear because more often than not Cache will be pawned at the beginning of your next turn. Kate "Mac" McCaffrey: Digital Tinker: Great identity with a natural affinity to both Cache and Aesop's Pawnshop. Cache can fit anywhere in the runner's turn. The runner can use it first to catch the Corp off guard with the unexpected credit pool or the runner can save Cache for later in the turn barring damage and other needs to draw. 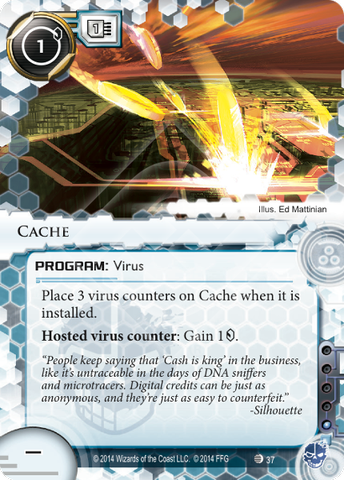 Do not leave two or more Cache programs with virus counters as the Corp may use the opportunity to purge virus counters. Because of the powerful synergy between Aesop's Pawnshop and Cache it is best to save Cache for when Aesop's is already in play.